Decided that lazy blogging is better than lazy non-blogging. 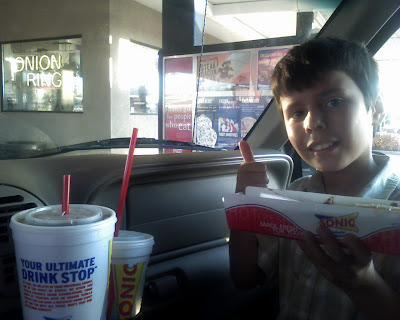 So here is a ten month old picture of Jake preparing to tear into a Sonic chili-dog. Sonic is YUMMMY. The tater tots are great. I wish we had them in SoCal; but, instead, all we have is their TV advertisements taunting us. Endlessly.